Silky Lecler sheet mask tackles the ageing process using a powerful trio: peptides, antioxidants and Advanced Hyaluronic Acid Complex. Peptides stimulate collagen and elastin production required for a firmer skin, antioxidants protect skin cells from free radicals. The mask is infused with a new generation of Hyaluronic Acid Complex made of large hyaluron molecules (Sodium Hyaluronate), which hydrate the outer layer of the skin and small hyaluron particles (Hyalo-Oligo), which penetrate deep into the skin. It is perfect for everyday nourishing for all stages of an ageing skin. ‘Suffuse, Contour and Immerse’ it is how the face mask uniquely hydrate the skin. Suffusing deep below the outer layers of the skin, contouring close to become a second skin so that every millimetre of the face is immersed in the deeply nourishing formula. A delicate combination of thin cotton fabric and silk makes the face mask to ensure there is added degree of comfort and ease of wear, while it gives a cocooning effect to the skin. Designed for easy movement- Lecler 20-min hydrating application lets you get on with the rest of your day while you let your skin absorb all the goodness of its active ingredient-rich serum. 1.Remove sheet from the sachet. 2. Unfold sheet and remove the white layer first. 3. Gently apply the sheet on a clean skin maintaining the blue layer on top. 4. 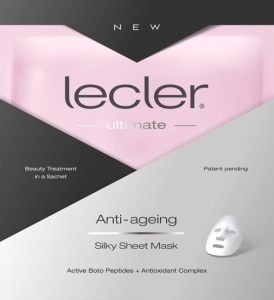 Remove the blue layer and gently press the sheet further into place, smoothing out the sheet on face ensuring as much contact as possible with the skin to release the sheet’s active ingredients. 5. Leave for 20 minutes. 6. Remove the sheet and gently massage any remaining serum onto the skin. Do not rinse face after application. For the best possible result recommended to use 1-2 times a week.